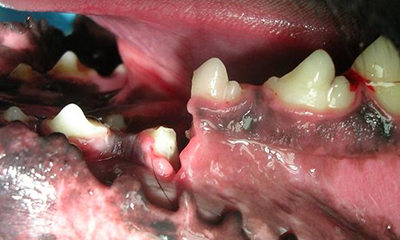 Jaw fracture(s) occur from facial trauma (dog bite, fall) or due to bone loss associated with tooth and gum infections. 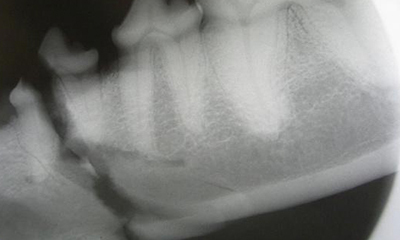 Click to learn about tooth fracture. 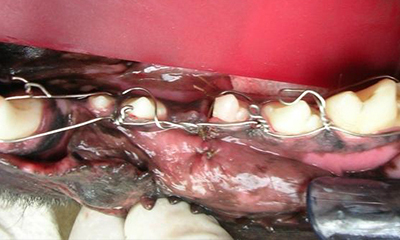 These patients must be evaluated under anesthesia to determine the best treatment method. Jaw fracture as a result of being kicked by a horse. Schedule an appointment today to have your pet evaluated for a fractured jaw. Facial trauma and bone loss around diseased teeth can result in fractures of the upper and lower jaw. Patients that have experienced trauma (fall, dog bite, car accident) are initially stabilized with fluids, pain medication, antibiotics, and chest or skull X-rays. An accurate treatment plan can only be developed after an evaluation under anesthesia that includes: evaluation of tooth structures, bone and major blood vessels/nerves using dental X-rays, skull X-rays and in some cases CT imaging. A veterinary dentist will utilize techniques that are minimally invasive, focus on tooth/jaw alignment, allow rapid return to eating/function and retain as many teeth as possible. Techniques include selective extractions, pulp capping, bone grafting, interdental wiring, intra-oral composite splints, bonding of teeth and in some cases titanium plates.